Please refer to our stock # T1843 when inquiring. Sold - Thank you! 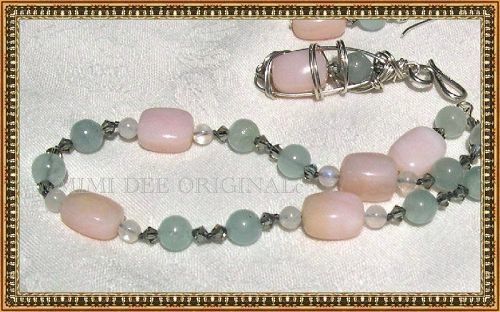 Hand knotted necklace made with 14mm pink Peruvian opal, 8 mm round aquamarine, 5mm moonstones and 4mm bi-cone Swarovski silver/gray beads. Designed, knotted and signed with the maker's mark: Miimi Dee - Sterling - Handcrafted in USA. All metal is sterling silver, which through the decades will achieve that rich patinated "antique, heirloom" look. While the pendant is sold, similar pendant can be commissioned Necklace: Sold - thank you! Enough product left for another pendant.